I came across this book at our local library and used it for some research for a seed saving talk I was doing. It gives an incredible insight into how we as a western society have evolved into the sophisticated, agriculturally-reliant countries around the world with some major disadvantages. Our health being one of them, but a whole host of issues raises it head from modern agricultural practices and this book brings them to the surface. 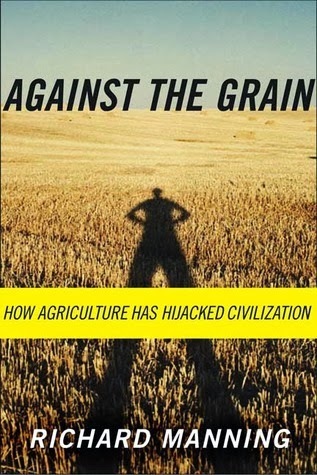 I guess to give a hint of what the book is about I could sum it up with the authors concept that we all advertise our ignorance to agriculture at least three times a day. That being the food we eat, the types of food we eat and the reasons for us actually eating it – they are far from our choice which is something I had never even considered. The reason being is that we are so detached from modern agricultural practices that we have no idea of some of the ways our food is handled and manipulated. Another point that Richard Manning portrays really well is that most of the major agricultural industries today grow and deal with commodities – NOT FOOD. When I really thought about this it triggered a whole heap of thoughts that bought me to the realisation that again, not all is what it seems. At the end of the book Manning gives his own portrayal of how he sees we as a society need to be operating. It is largely a move back from an agricultural industry growing commodities to enterprising individuals and co-operatives growing food for local communities. Thus we can see the reason behind the popularity of today’s farmer’s markets, community gardens and backyard vege patches – there is a huge market in todays society for growing FOOD – not commodities such as rice, wheat and corn. If you suspect the wool has been pulled over your eyes then Manning’s research and presentation of the material is intriguing and easy to read – and will showcase some of the ways we have been manipulated by big business. For me it has confirmed my engagement with our own backyard food garden and the permaculture principles we use to create something quite unique in today’s world – the place where the food on our table comes from.